Two summers ago, I read an article by a Baylor Sociology professor that claimed students in his class performed better on assessments when the teacher reframed "Test Days" by instead referring to them as "Learning Celebrations." So, always looking for ways put a positive spin on things, I decided to make the change myself starting last school year. I told students that instead of taking "tests" where students are worried about what they didn't learn, we would instead focus on celebrating what they did learn. While I definitely received numerous odd looks and eye rolls from students when I first introduced the idea, "Learning Celebrations" have become an important part of the class vernacular for both myself and my students. We even blast "Celebration" by Kool & The Gang as students arrive to class (in addition to some really bad dancing by myself) to give them an extra boost of positive vibes before we start the Learning Celebration. And though the simple name change hasn't done away with all anxiety students may feel when taking a unit assessment or magically led to all students earning A's, I did see an increase in class averages from previous years on a majority of my assessments. A vital part of Learning Celebrations is actually getting to celebrate how well students performed the day after. My classes set aside the day after a Learning Celebration to give students time to reflect on how they did and give them opportunities to see what they knew and what they didn't. Student are always anxious/excited to see the grade they received, but it is even more important (especially in a class that is cumulative like AP Psychology) that students get a chance to fill in any gaps of knowledge that may exist. A student who scores an 85% on an assessment is seemingly in a pretty good place grade-wise, but that still means that the student did not know 15% of the content. If students don't reflect and learn the right answer to a question they missed, that 15% could continue to get wider and wider. This would then form a considerable gap in their knowledge, leading to them making the same mistake when faced with a similar problem later on. I have a poster in my room that states, "An error doesn't become a mistake until you refuse to correct it." That kind of thinking guides our Learning Celebration Reflection. I have various activities I use on reflection days throughout the year, but the one I like to do with the first unit is a team retake. Students are placed in homogeneous groups of 3-4 based on their individual scores (but they don't know how they scored until after the team retake). I also try to group students that don't normally sit by each other or work together as much as possible to get them interacting with more of their classmates and possibly reduce distractions. They are tasked with retaking the entire multiple choice section of the Learning Celebration, with the promise of earning some extra points if they do even better on the team retake than they did individually. The conversations, debates, and friendly disagreements are incredibly rewarding to listen to, especially when they have "Aha!" moments related to questions or answer choices they may have read or interpreted wrong the first time through. Their ability to arrive at those moments through self-realization or guidance from classmates is a lot more meaningful with a longer-lasting impact than if I simply told them the right answers myself. When groups finish the retake, everyone in the group gets their individual scores back, getting time to see what they got right and wrong themselves, helping peers with questions they answer incorrectly, and ensuring their errors do not become a mistakes. Once all groups have finished the retake, I talk about the class average and single out the most-missed questions for further review. Last year, I added one more thing to my reflection days as a way to further connect to the content we learn in Unit 1 of AP Psychology. The first unit is on Research Methods, which includes a part on statistics and how data is used to interpret results of studies. 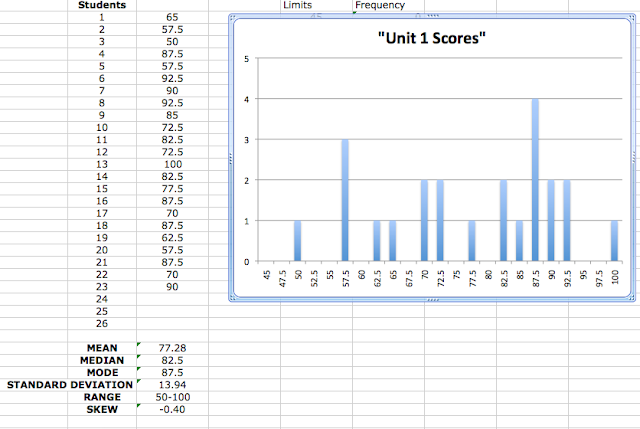 On an Excel spreadsheet, I calculated the Mean, Median, Mode, Skew and Standard Deviation of the data on an Excel spreadsheet, along with creating a Histogram (bar chart) to see if there was a Normal Curve....all terms we learned in the first unit. I'm no Excel whiz, but YouTube is a magical place to learn how to do things! I share all that data and the graph with the students so they can see the statistics at work, especially with a concept such as standard deviation, which can be confusing for students. Statistics are not overly relevant in most of the other units over the rest of the course, but I continued inputting data from the Learning Celebrations to show students on reflection days and it has become a mainstay in the reflection process. One last way I tried to connect the content with our reflection was through a demonstration of correlation. In the Research Methods unit, one of the most important concepts is that "Correlation does not prove causation!" However, identifying correlations can give us valuable information on how two variables might be related. One required assignment I have for each unit is completing a Unit Review Quiz on Schoology that takes 20 random questions from a question bank. Students can take the Review Quiz as many times as they like, getting a different set of questions each time, and I take their highest score as their grade. Since there is no way to reasonably gather data on the amount of reading, studying, note-taking, etc. each student does to prepare, the best accessible and objective data point I have to see if there is a correlation with success on the Learning Celebration is if students had actually taken the Review Quiz. 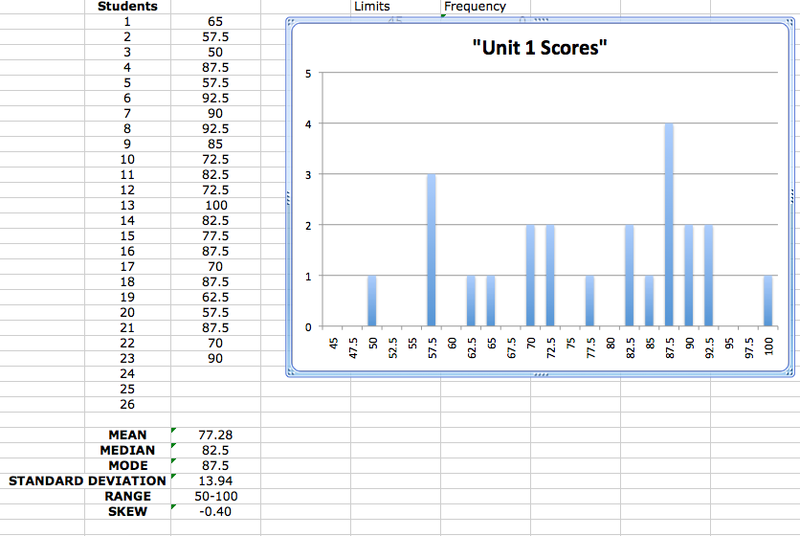 I calculated the average score of students who completed the Unit Review Quiz at least once vs. the average score of students who did not do the quiz at all. I stressed the idea that "correlation does not prove causation," so I wasn't claiming that taking the Schoology Review Quiz automatically led to higher scores. But the data did show that those that took the quiz were at least more likely to score higher than those who did not. Not only was I able to again connect to the content we learned in the unit, I'm hoping it will inspire more students to take advantage of the review tool in preparation of future celebrations. After all, reflecting on Learning Celebrations is a lot more enjoyable when the scores show there's something to celebrate! This is a very interesting concept, but it appears to be a simple reverse psychology tactic. That being said, for students who do not care whether or not a concept was learned when a learning celebration day approaches, how could this change their mentality? You worked with an AP class with this study, how would this differ in a less academia class? Thanks for the questions! I also taught mainstream US History classes last year and now a Criminal Law class this year that are not AP level. I used the "Learning Celebration" concept with those classes as well with the same success in terms of developing a positive culture in the classroom and improved results on assessments from previous years. I take a day after the Learning Celebration to reflect in those classes too using team tests, individual test corrections, self-reflections, or other activities to be able to identify what they knew and what they didn't. While those classes are not as cumulative as an AP class (though they will need to know the content for the Final Learning Celebration at the end of each semester), I still want to stress the importance of filling in the gaps of knowledge so they won't get wider over time. I always like to make connections to previously learned material as I go through the course, so if the students never learned that content in the first place and didn't get a chance to realize that through our reflection, then it hurts their ability to learn the new information later on as well. Finally, more than any other year I have taught before, I took a great deal of class time in the first week of school to hammer home the idea of the Growth Mindset with all of my classes, both AP and mainstream. I have a bunch of posters in my room dedicated to the idea that failure is not an end result, but rather every time you fail is simply an opportunity to learn. I refer to Thomas Edison "learning" 1000 different ways of how NOT to make a light bulb before his final success. I talk about the importance of simply trying your best, being willing to try and be wrong, and when all else fails, just keep trying. That an error does not become a mistake unless you refuse to correct it. That you never fail until you stop trying. That you shouldn't do something until you get it right, you should do something until you can't get it wrong (I use a basketball analogy for that one). That "whether you think you can or think you can't, you're right." I refer to these concepts constantly throughout the year as reminders as we go. It definitely is difficult to convince teenagers to care more about and focus more on the process than the end result (grade), but just getting them to think a little bit differently about the importance of the process is extraordinarily helpful. I've seen a TED Talk about how the greatest predictor of success is Grit and read articles about how failure can be our best teacher. I communicate those ideas so that when students do hit a road block in their learning or don't do well on an assessment, they are ready, willing, and able to continue on and just keep trying. I hope this helps you think about how it can apply to other classes. Obviously the "Statistics" part of the reflection I do with my AP Psych is more specific because it connects with content we learn, but I still look at the averages and most missed with my mainstream classes on our reflection days. Thanks again for your questions and good luck with your classes! Create and Reflect with Apple Clips!